When it isn’t out to slay net neutrality or throttle internet speeds for Netflix and YouTube, it appears that Verizon wants to educate people about the internet. The telecommunications conglomerate has quietly rolled out a pleasantly-designed interactive website that aims to explain how Wi-Fi works to anybody lacking the knowledge or the the technical background to research it on their own. 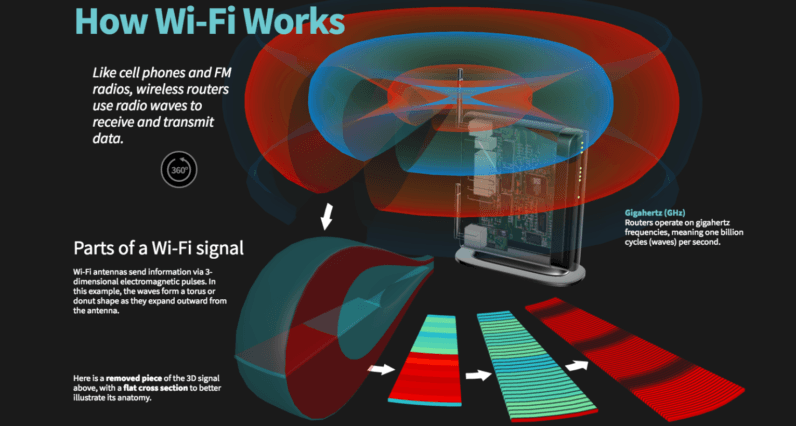 Equipped with a series of animated visualizations, the page contains information about the basic principles of how wireless routers are built and how the science behind them works. It also features segments that break down dense concepts like frequency bands, encrypted connections and more. One particularly cool thing is that the website also supports 360-degree visualizations which allows you to easily explore the animated graphs in more detail and from various angles. To take advantage of this feature, simply click on the 360-degree button. But it turns out that, despite the cool design, Verizon failed to get all the facts straight for its new page. Indeed, several Hacker News readers have so far indicated that the the company has gotten some details wrong. So you might want to take any information you find on the new page with a grain of salt. While there is nothing wrong with seeking to educate the masses, one can’t help but wonder what Verizon is hoping to accomplish with a campaign of this sort – especially in midst of heated net neutrality debates. Some concerned users are speculating that, as a well-documented net neutrality usurper, Verizon could eventually look into quietly tweaking the contents of the page to back up its own agenda – which is to rewrite the laws of net neutrality according to its own benefit. So in case Verizon’s Wi-Fi page fails to answer your questions why your internet connection to certain websites or services remains laggy – there is a simple way to find out whether something else is causing the issue. Update: Following our coverage, Verizon has decided to take down the page “for maintenance.” Those still curious to check it out can access a cached version from the Internet Archive (unfortunately, the beautiful visualizations no longer work from this link).